Are you a victim of Gaslighting? Do you suspect your partner is cheating? Does your partner deny this and claim you are crazy and imaging things. Does your partner continuously deny they said or did something (even though you have proof) to the extent it causes you to questions yourself? Does your partner tell others you are “crazy”? If so then you are probably a victim of a gaslighter. Ask your partner to take a polygraph test, an innocent person should have no problem clearing their name. 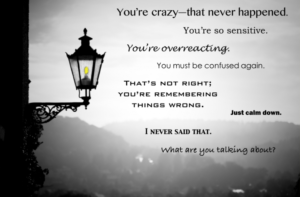 What is gaslighting? Well there are various definitions, but essentially it is a form of psychological manipulation which seeks to a make the victim doubt their memory perception and sanity. It’s a malicious form of abuse and like all form of abuse it is based on the need for power and control. The term “gas light” originated from a 1938 stage play by Patrick Hamilton whereby an abusive husband tried to drive his wife crazy by dimming the lights (which were powered by gas) and then denied the lights had changed when his wife pointed it out. Gaslighting is often a gradual process in a relationship and results over time in a victim becoming confused, anxious and losing the ability to trust their own perceptions. This gives the abuser more control over the victim. Gaslighters often accuse their victims of something they themselves are doing- such as cheating. They will tell others the victim is crazy, so if the victim confides in others about the gaslighters behaviour, they will not be believed. 1. They tell blatant lies – You know it’s an outright lie. Yet they are telling you this lie with a straight face. Why are they so blatant? Because they’re setting up a precedent. Once they tell you a huge lie, you’re not sure if anything they say is true. Keeping you unsteady and off-kilter is the goal. 2. They deny they ever said something, even though you have proof – You know they said they would do something; you know you heard it. But they out and out deny it. It makes you start questioning your reality—maybe they never said that thing. And the more they do this, the more you question your reality and start accepting theirs. 3. They use what is near and dear to you as ammunition – They know how important your kids are to you, and they know how important your identity is to you. So those may be one of the first things they attack. If you have kids, they tell you that you should not have had those children. They will tell you’d be a worthy person if only you didn’t have a long list of negative traits. They attack the foundation of your being. 4. They wear you down over time -This is one of the insidious things about gaslighting—it is done gradually, over time. A lie here, a lie there, a snide comment every so often…and then it starts ramping up. Even the brightest, most self-aware people can be sucked into gaslighting—it is that effective. It’s the “frog in the frying pan” analogy: The heat is turned up slowly, so the frog never realizes what’s happening to it. 5. Their actions do not match their words -When dealing with a person or entity that gaslights, look at what they are doing rather than what they are saying. What they are saying means nothing; it is just talk. What they are doing is the issue. 6. They throw in positive reinforcement to confuse you -This person or entity that is cutting you down, telling you that you don’t have value, is now praising you for something you did. This adds an additional sense of uneasiness. You think, “Well maybe they aren’t so bad.” Yes, they are. This is a calculated attempt to keep you off-kilter—and again, to question your reality. Also look at what you were praised for; it is probably something that served the gaslighter. 7. They know confusion weakens people -Gaslighters know that people like having a sense of stability and normalcy. Their goal is to uproot this and make you constantly question everything. And humans’ natural tendency is to look to the person or entity that will help you feel more stable—and that happens to be the gaslighter. 8. They project – They are a drug user or a cheater, yet they are constantly accusing you of that. This is done so often that you start trying to defend yourself, and are distracted from the gaslighter’s own behavior. 9. They try to align people against you -Gaslighters are masters at manipulating and finding the people they know will stand by them no matter what—and they use these people against you. They will make comments such as, “This person knows that you’re not right,” or “This person knows you’re useless too.” Keep in mind it does not mean that these people actually said these things. A gaslighter is a constant liar. When the gaslighter uses this tactic it makes you feel like you don’t know who to trust or turn to—and that leads you right back to the gaslighter. And that’s exactly what they want: Isolation gives them more control. 10. They tell you or others that you are crazy- This is one of the most effective tools of the gaslighter, because it’s dismissive. The gaslighter knows if they question your sanity, people will not believe you when you tell them the gaslighter is abusive or out-of-control. It’s a master technique. Your ticket for the: Are you a victim of Gaslighting?